You know that user feedback is crucial — after all, your users will decide whether your app succeeds or not — but how do you know whether users are being fair and objective in their feedback? We can tell you: They won’t be. All of your users will be giving you biased feedback. They can’t help it. It’s important to be aware of this, especially when reviewing comments about your user experience (UX). Accurate and unbiased feedback is essential to developing the best possible version of your app. Although you can’t erase your own biases (or those of your users), you can take steps to overcome common biases once you know what they are and how they might appear. The next time you ask your users for input, keep bias in mind and evaluate how you respond to users’ comments. Is your action (or inaction) driven by bias? This is probably the most well-known bias encountered by people of all professions. Psychologist Daniel Kahneman, who first introduced the concept of confirmation bias together with mathematical psychologist Amos Tversky, says that confirmation bias exists “when you have an interpretation, and you adopt it, and then, top down, you force everything to fit that interpretation.” Confirmation bias occurs when you gravitate towards responses that align with your own beliefs and preconceptions. Solely accepting feedback that aligns with your established narrative creates an echo chamber that will severely affect your approach to UX design. One dangerous effect of confirmation bias is the backfire effect, in which you begin to reject any results that prove your opinions wrong. As a designer, you are tasked with creating the UX that best serves your audience, but your design will be based in part on your subjective tastes, beliefs and background. Sometimes, as we learned firsthand, this bias can sneak its way into your process — not so much in how you interpret user feedback, but in how you ask for it. Confirmation bias often shows up when one is creating user surveys. In your survey, you might inadvertently ask leading questions, phrased in a way that generates answers that validate what you already believe. Our UX designers asked leading questions like, “Did the branding provide a sense of professionalism and trust?” Questions like this don’t allow space for users to provide negative or opposing feedback. By removing our designers from the feedback process, the questions naturally became less biased in phrasing — our QA engineers asked non-leading questions like, “What sort of impressions did the app’s look and feel provide?” As a result, we began to see far more objective and truly helpful feedback coming from users. Framing bias is based on how you choose to frame the user feedback you’ve received. This kind of bias can make a designer interpret an objective metric in a positive or negative light. Nielsen Norman Group offers a fascinating example that describes the results of a user feedback survey in two ways. 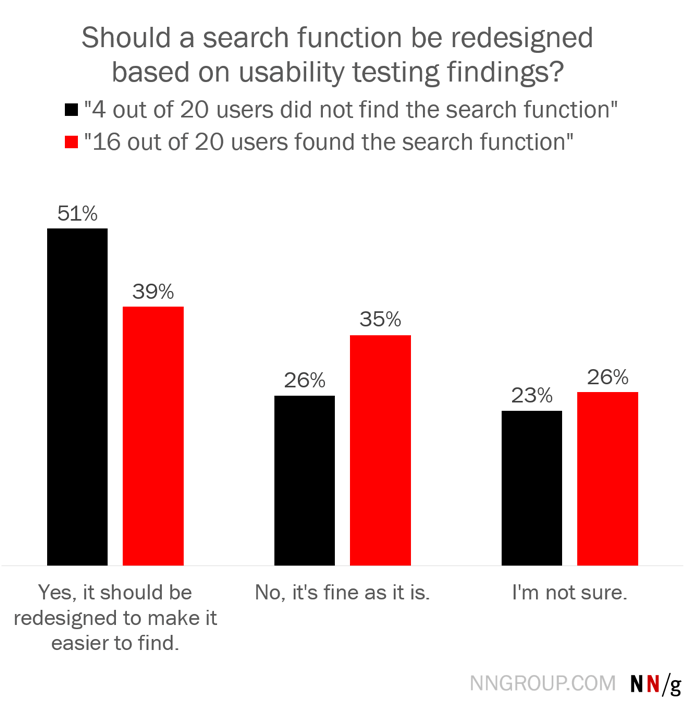 In the first, 4 out of 20 users said they could not find the search function on a website; in the second, 16 out of 20 users stated that they found the search function. The presence of framing bias when analyzing data can lead to subsequent effects, such as the clustering illusion, in which people mistakenly perceive patterns in data that are actually coincidental, or the anchoring effect, in which people give much more weight to the first piece of data they look at than the rest of the data. These mental traps can influence the decisions you make in the best interest of the product. Friendliness bias — also called acquiescence bias or user research bias — occurs when the people providing feedback tell you the answers they think you want to hear. Sometimes, this happens because they think fondly of you and respect your professional opinion, but the reason can also be less flattering. People might tell you what you want to hear because they’re tired of being questioned, and they think positive answers will get them out of the room (or out of the online survey) faster. This is the principle of least effort, which states that people will try to use the smallest amount of thought, time and energy to avoid resistance and complete a task. This principle has probably already influenced the usability of your UX design, but you might not have considered how it comes into play when collecting feedback. Be mindful, especially if you go the digital route, of survey fatigue. When you ask too many questions, your users might begin to tire partway through the survey. This can result in people simply selecting answers at random (or choosing the most favorable answers) just to finish faster and expend the least amount of effort. To avoid friendliness bias due to survey fatigue, keep surveys as short as possible and phrase the questions in very simple terms. Don’t make all questions required, and edit the survey diligently to cut all questions that aren’t truly relevant or necessary. A 1976 Stanford study asked 104 college students to walk around campus wearing a sandwich board advertising a restaurant. The study found that 62% of those who agreed to wear the sign believed others would respond the same way, and that 67% of students who refused to wear the sign thought their peers would also respond negatively. The fact that both of these groups formed a majority in favor of their personal belief is an example of false-consensus bias. False-consensus bias can be avoided by identifying and articulating your own assumptions. When you begin creating a user survey or crafting a test group, ask yourself, “What do I think the results of this feedback will be?” Write them down — these are your assumptions. Even better, ask a friend or coworker to listen to you describe the product, and have them write down the assumptions and opinions they hear from you.